Mobile malware and narrowly-targeted attacks are steadily rising, according to a McAfee report released earlier this month. These ticking time bombs and other security threats should concern your small business. In many ways we've achieved a sort of equilibrium with regard to malware since the days of Internet-crippling cyber attacks like Code Red and SQL Slammer. The flood of malware hasn't stopped, but as long as you have security software in place and keep it up to date you're relatively safe from most threats. You still can't let your guard down, though. McAfee's research indicates that threats are rapidly proliferating as criminals' goals and techniques evolve. McAfee distilled information gathered from a network of millions of sensors, as well as its cloud-based McAfee Global Threat Intelligence service, and compiled the data to produce the "McAfee Threats Report: Fourth Quarter 2012 (PDF)." In this report, the security provider found that spam volume spiked initially, then declined by the end of the year. It also found a similar pattern with botnet infections—a dramatic increase that tapered off, then dropped to reach lower than previous levels. McAfee has been sounding the alarm over mobile malware for a while. It’s true that McAfee has a vested interest in raising concerns over potential security threats because it sells security software, but as the saying goes, just because you’re paranoid doesn’t mean they’re not out to get you. 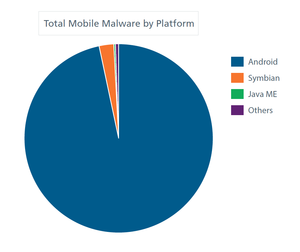 The reality is that the number of detected mobile malware attacks continues to skyrocket. McAfee counts over 36,000 mobile malware threats—almost entirely targeting the Android OS. Granted, none of the threats have yet resulted in any widespread compromise of Android devices, but if workers at your business use Android—whether officially or under a BYOD policy—be aware that the threat is out there, and growing. Targeted attacks are more insidious than traditional malware attacks. The other serious concern is the increase in narrowly targeted cyber attacks, such as Operation High Roller and Project Blitzkrieg, which McAfee's report analyzes in depth. Combined with research on threats like Red October, the report illustrates that cyber criminals can be very patient when the stakes are high enough. Some attacks take years to develop and execute, and because they’re precision attacks aimed at specific targets they’re harder to identify. These are the major highlights, but there’s a lot more information covered in the 38-page report that can help your company prepare and defend itself.